The United Nations and its member organizations produce a large amount of data on a regular basis. While this may be challenging for diplomats and UN employees to sift through, it provides data researchers with a vast number of easily available data sets for analysis. The United Nations Office of Information and Communications Technology periodically launches challenges as part of its Unite Ideas initiative to crowdsource solutions from data researchers and the general public. My solution - “Global Policy”, was awarded the first prize for one such recent challenge named UNGAViz. The UN General Assembly has passed thousands of resolutions on a range of different issues. While most resolutions are passed unanimously without a vote, several others require a vote to be cast by the member states before being adopted. The UNGAViz challenge involved analysing and visualising the several different resolutions passed by the general assembly, in a manner which would simplify analysis of this huge data set by ordinary citizens as well as diplomats. In any data analysis solution, the main challenge is to structure the data so that it is effective in informing users in making appropriate choices. Too much complexity in terms of choices offered to the user, or in representation of data, is more likely to confuse the user than to help. On the other hand, simplifying the interface too much could mean that important information never reaches the user. The challenge requirements made it clear that the solution should be useful to diplomats as well as the general public. This pretty much includes everybody. With such a wide spectrum of potential users, balancing simplicity with presentation of detailed information becomes even more important. The interface needed to be simple enough to be used by people who weren’t particularly acquainted with the terminology and procedural details familiar to UN personnel. At the same time, it would need to retain enough analysis and details so as to be useful to diplomats in their decision making process and to provide researchers a deep understanding of their chosen topic. The solution starts off by asking the user for one single input - The topic that they would like to research. This serves two important purposes. Firstly, it ensures that the user is not burdened with too much complexity in terms of configurable values and selection of settings which would only serve to turn away casual users who wish to gain a broad overview of discussions by the UN General Assembly. And secondly, it sets the focus of subsequent information presented by making it clear that all further interactions with the tool are centered around the topic entered by the user. 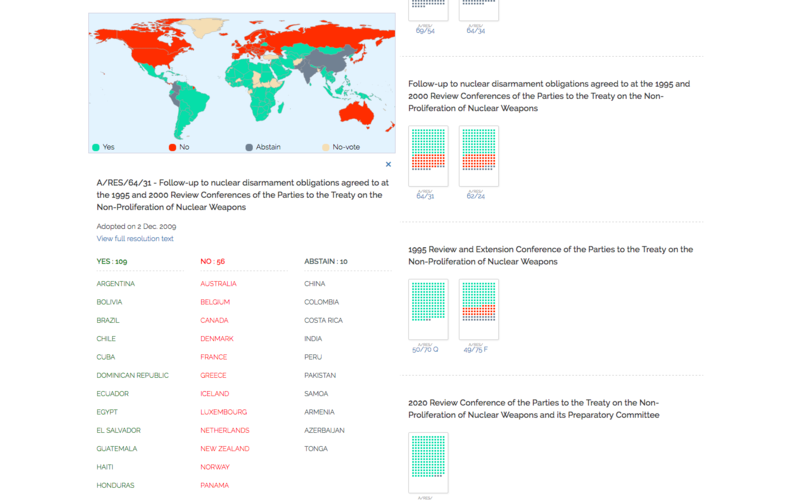 The tool provides a standard experience to all users, ranging from a casual user wishing to research “Weapons in Space” to diplomats making important policy decisions. At each stage of analysis, more details are progressively provided to users to enable in-depth research. After accepting the topic the analysis focuses on three distinct but interrelated viewpoints. 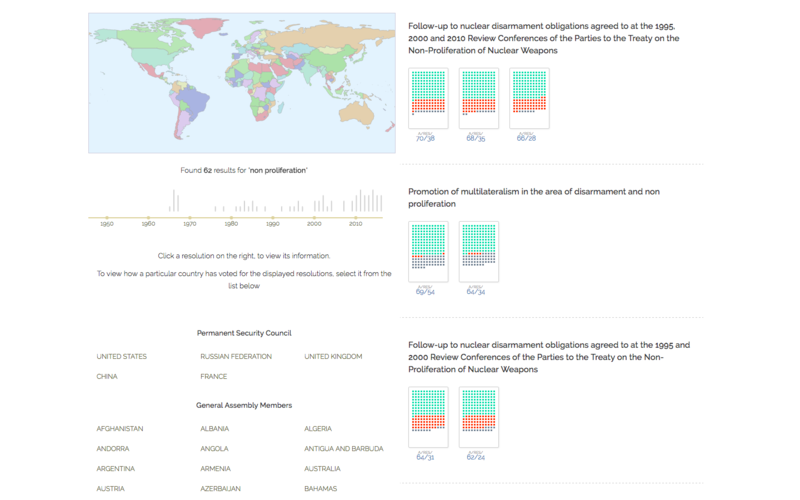 Interest in the topic over time and a listing of the resolutions passed - These are useful indicators of the importance that the topic has been given at the UN, and the time periods when the topic was most in discussion. Voting patterns for voted resolutions - so as to differentiate the more contentious resolutions from the widely supported ones. Country specific analysis helps diplomats analyze the behavior of any country and identifies other countries with similar or opposed voting patterns. Users can select any country including former states that no longer exist, and analyze their behavior in greater detail. 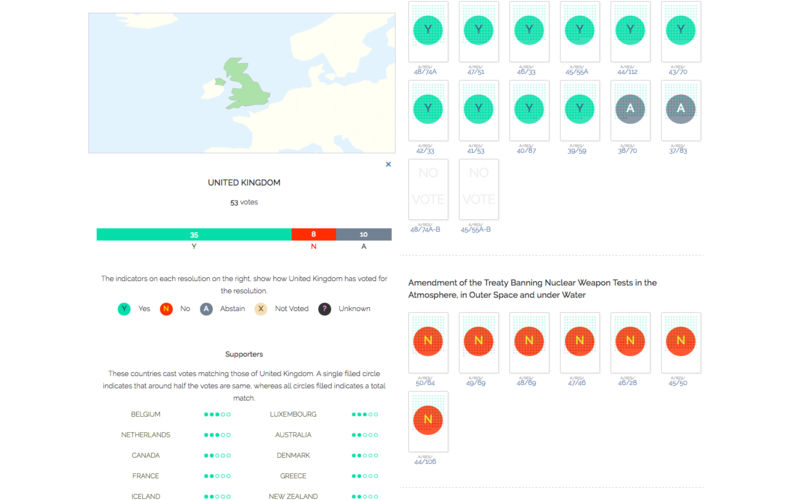 Every resolution in the list is overlayed to visually show the vote cast by the selected country for that resolution. Analysis of the past voting record of a country can be a useful indicator of its stance towards future resolutions. More importantly, the votes cast by the country are analyzed against those cast by every other country to get a list of supporting and opposed countries. This should help diplomats quickly identify the groups of countries sharing a similar stance on any given topic. Detailed information regarding voting patterns is displayed visually on a map as well as in tabulated form. A link to the full resolution text is also provided so that the user can get individual details which were not available in the visualization itself. Design is one of the most crucial aspects towards making any visualization successful in effectively representing its underlying information. Instead of using numbers and text to show each piece of information, the solution uses a more visual form to represent parts of the data during analysis. Among other visual indicators, resolutions are overlayed with colored blocks to show voting counts and a map shows voting patterns as well country locations. While visual appeal is one factor of a successful design, another equally important factor is the ease by which a user can access relevant information. To allow users to easily access any particular aspect of analysis, the solution attempts to ensure that in most cases, switching the focus of analysis is only a single click away. So the user can quickly switch from the broad overview, to analysing a particular country, to analysis of a particular resolution and back, with a minimal number of clicks. Challenges such as this provide a unique opportunity to improve one’s own abilities while at the same time producing something which could have a positive impact. I hope that the solution proves useful to the general public as well as diplomats to extract meaningful information from the vast amount of data present in the resolutions and their voting patterns.